Friends & Family sale is on at OshKosh B'gosh stores in the United States. Receive an extra 25% discount on your entire purchase. The offer is also available online with promo code FAM25. 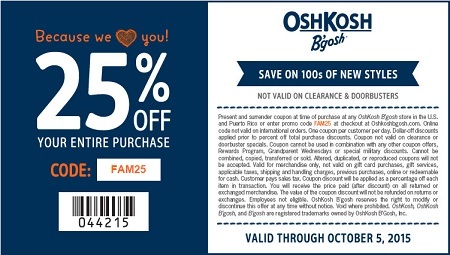 If you want to receive the offer at OshKosh B'gosh stores it is necessary to print the sale coupon and show it the during the time of your purchase. Source of the information is OshKosh B'gosh. Offer ends 10/05/2015. More details available at stores.